Every 50 seconds, for nearly a year, about 2.5 gallons of water has flowed into Gerard and Penelope Garcia’s Summit home. You read that right: about 2.5 gallons of water every 50 seconds. Rain or shine. The Garcias have become water detectives, but their sleuthing hasn’t solved the problem. 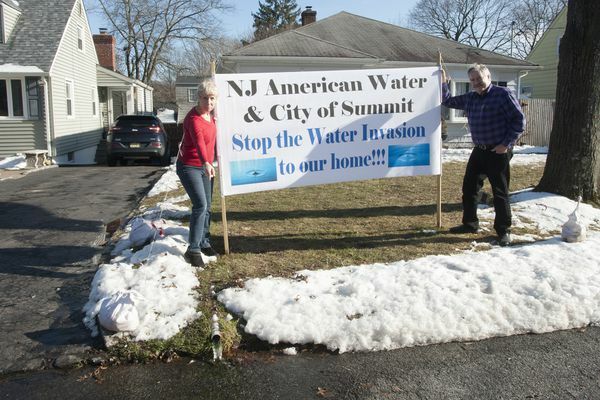 Neither have attempts from the couple’s water company, New Jersey American Water (NJAW), nor have efforts from elected officials, inspectors and engineers from Summit, Gerard Garcia said. The water just keeps flowing into their basement, spewing from a source no one can find. The Garcias purchased their home in 2012, and the first sign of trouble came in April 2014. During a powerful rainstorm, the couple’s sump pump – which they never needed before – failed. The basement flooded with several inches of water, Gerard Garcia said. The couple assumed the water came from the heavy rains, so they fixed the sump pump. But that didn’t correct the water problem. Instead, days after the rain stopped, the sump pump kept pumping water. Instead of the basement, the water now flooded into Garcia’s and a neighbor’s yard. Garcia contacted NJAW, the water company. NJAW didn’t find a line break at the Garcia home, but it did find one at a nearby condo development. Garcia said he learned from NJAW that the home flooded in 2008 after a similar line break at the condos. Over the next several weeks, Garcia said and records show, fixes were made to multiple pipes at the development, but that didn’t stop the water flow into the Garcia’s basement. “Frustrated, we went to Summit City Hall where the Chief Inspector of the Department of Community Service refused our letter and dismissed us by saying it was not the problem of the city,” Garcia said. The couple persisted, and while NJAW searched for more leaks, they contacted the mayor, public works and everyone else they could think to call. In June, the Garcias installed two large signs on their front lawn, begging for help. “Over 70,000 gallons of water down our drain!! Does anyone care? 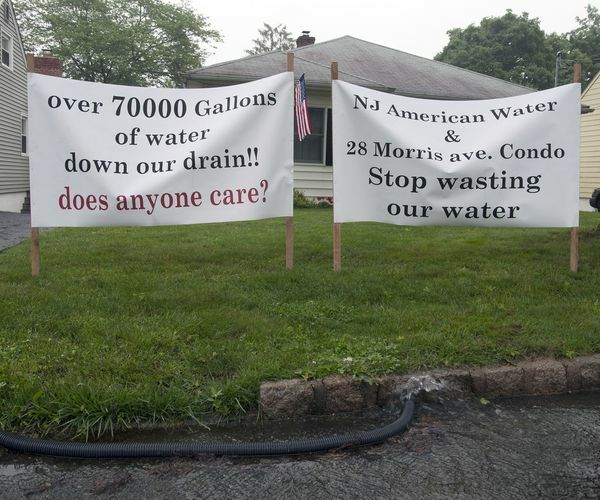 NJ American Water and 28 Morris Ave. Condo, stop wasting our water!” the signs said. “Within a few hours American Water came by saying, ‘You have our attention,’” Garcia said. The company stepped in and the condos fixed another pipe, Garcia said. But again, it didn’t solve the problem. They hired an attorney but by the end of July 2014, somehow, the water stopped. On May 1, 2018, it started all over again. Water flowed in through the sump pump and out to the neighbor’s yard, Garcia said. NJAW came back but couldn’t find a leak, but the pump outflow increased to 90 gallons every 24 hours, Garcia said. On May 23, NJAW said there were more repairs at the condo development, the couple said. The Garcias were out of town, so they couldn’t check the home until four days later. “The amount of water coming through our sump pump, we measured, was now 800 gallons per 24-hour period,” Garcia said. In June, the NJAW representative came to the home to test the water in the sump pump. The test could indicate whether the water was natural groundwater or treated water from the company. The first test found chlorine in the water – indicating it was probably from a broken pipe somewhere – Garcia said, but the second and third tests were inconclusive. The rep also did sound tests and searched for more leaks at the condos, but nothing was found. By July 10, the water had stopped, only to start up again on Aug. 13, Garcia said. Garcia said when he reported it to NJAW, the rep suggested recent rains were the cause, but he promised to survey the area again. Garcia took matters into his own hands, digging a trench and installing pipes from the sump pump pipe, six inches under the soil, to guide the water to the street. Instead of flooding the neighbor, the water would flow onto the street, Garcia said. But the sump pump was still working on overdrive. “We purchased chlorine test kits and found no difference between the water coming in with the water coming out of our faucet,” he said. Then after heavy rains around Nov. 7, Garcia said, the flow of water became a waterfall, increasing from 2.5 gallons every 10 minutes to 2.5 gallons every minute. But weeks after the rains, the water kept coming, so Garcia reached far and wide for help. 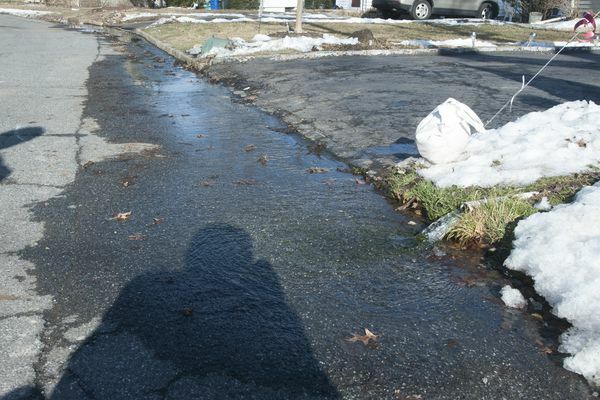 Now that it was winter, the couple had to worry about the water, which now flowed across the entrance to their driveway and down the street, freezing. In early January, the mayor and the city engineer visited the scene of the water invasion. Shortly thereafter, BPU said in a letter that water testing was inconclusive on chlorine, but did show a low level of orthophosphate. The substance, used in water treatment to inhibit pipe corrosion, would have been found at higher levels if the water was coming from NJAW’s pipes, BPU said. The letter said the evidence supports groundwater as the source, and with no further evidence of leaks and NJAW monitoring the situation, there was nothing further BPU could do. On Feb, 14, the city engineer emailed to say the city was looking into additional diagnostic testing, including a sewer line camera inspection. He also had a new suggestion: The city was looking into the feasibility and cost of installing a new drain so water from their discharge pipe would go to the storm sewer system. the engineer wrote. That didn’t sound right to the Garcias. Then the engineer recommended they hire a hydrogeologist – someone trained to see how water flows underground. The Garcias went to a city council meeting in early March to plead their case, water still flowing at 2.5 gallons every 50 seconds, but nothing has come of it. “We are back to square one,” Garcia said. Garcia also had the water tested himself, and it came back “probable” that it’s not treated water, meaning it may not be coming from an NJAW pipe. The testing company suggested it could be from a broken drain pipe because the flow doesn’t change with the weather – rain, snow or dry conditions. After reviewing the couple’s long and detailed timeline, emails between the Garcias and city and state officials and other documents related to the water, we asked Summit Mayor Nora Radest for a status update. “As our company is not the cause of the water issue, unfortunately there is simply nothing else we can do,” spokeswoman Denise Venuti Free said. A spokesman said NJAW was in compliance with applicable laws and regulations, no leaks were detected, and the board has no jurisdiction over groundwater. And still, the water keeps flowing. The couple reached out to all kinds of professionals – hydrogeologists, land gradient experts, waterproofers and more – hoping that someone could come up with a plan. Several suggested the water could be from a cracked drain pipe and it’s simply following the same path as water did in the past – something that could explain the varying water test results. They recommended the city perform a dye-tracing test, which would be cheaper and more informative than a camera line test, Garcia said. The Garcias made the request before the city council Tuesday night, and the council agreed to test the drainage and sewer system this month. “They told us they are not responsible if the water comes from private property,” Garcia said. As the Garcias await the results, they hope their sump pump doesn’t burn out. This entry was posted on April 6, 2019. Bookmark the permalink. ← Bamboozled March 7, 2019: Couple tries to pay final FIOS bill but it gets sent to collections. See what Verizon did next.